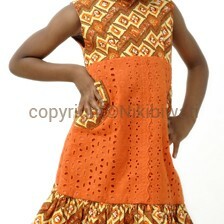 Colorful summer dress made with dry lace and ankara. Ankara Dry la..
Niki Biwati is a clothing line located in Lagos, Nigeria. We cater for the fashion needs of women of all sizes. We produce ready to wear dresses, tops, shirts, jackets, "Oleku" & also bespoke designs with African fabrics. Our styles are unique and elegant with a vibrant fusion of colors and prints. We also stock fashion accessories like bags, shoes and costume jewelry. Copyright © 2013 Nikibiwati. All Rights Reserved.